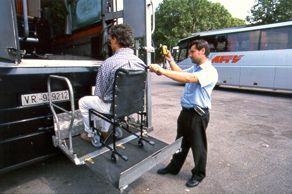 Accessible Italy Dept has been working with several hotels in the main touristic cities like Florence, Rome and Venice for many years. We have contacts with luxurious and high standard quality hotels as well as with cheaper and medium standard quality hotels. In any case we guarantee good service, competitive rates and central position in each of these cities. click here to Visit our ACCESSIBLE ACCOMMODATION CATALOGUE! Tourism in Italy is not a recent activity, but recent is the awareness that always more less-challenged tourists are travelling around the world and that Italy needs to become adequate to accessible services standards in order to give hospitality to hundred peoplewith special needs. It is not in the van yet, but many receptive structures and tourist services are improving their quality services. Accessible Italy Dept is specialized in the research of new accessible hotels and holiday houses located all around Italy.